Both dried and fresh dates are a great source of sugar, antioxidants, fiber, and essential minerals and vitamins. 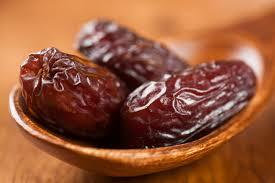 Dates are packed with iron, calcium, sodium, phosphorus, zinc, magnesium, and other essential minerals. Vitamins such as riboflavin, thiamin, vitamin A, folate, niacin, and vitamin K are plentiful in dates. Thanks to all these nutrients, including dates in your diet will provide you with a number of health benefits. The most impressive benefits are shown below. Regular consumption of dates provides you with all-important nutrients you need to stay healthy. Here is more about the benefits. Iron, a major component in hemoglobin, helps maintain the amount of blood cells. Dates provide you with 11% of your recommended daily intake of iron which regulates the flow of oxygen in the bloodstream. Moreover, it contains vitamin K that is essential for coagulation of the blood. You get 0.90mg of iron from 100g of Medjool dates, and you need more iron when you are pregnant. Any iron deficiency can lead to anemia. The presence of copper also plays a role in the production of red blood cells. Dates provide you with a variety of minerals and vitamins that help keep your bones strong. They are loaded with calcium that is essential for stronger teeth and bones. Fluorine prevents tooth decay. Moreover, you get magnesium, manganese, selenium, and copper from dates that promote healthy bones. One of many benefits of eating dates is that it improves your sexual stamina. Known as a natural aphrodisiac, they contain estradiol and flavonoids that make it beneficial for healthy sexual functioning. Regular consumption of dates will help increase sperm count and motility. Dates are good for your nervous system mainly because of their potassium content. Eating dates will make your nervous system more responsive and keep your brain alert. The presence of vitamin B6 makes dates beneficial for your brain performance and functioning. The dietary in dates can lower bad cholesterol. Moreover, dates are rich in potassium and magnesium which can lower blood pressure and promote better heart function. By eating dates, you can maintain a balance in sodium to potassium ratio, which in turn lowers pressure applied on the walls of the arteries. Dietary fiber in dates works at cleansing the colon as a bulk laxative. Dates help to relieve constipation and control diarrhea. They can even decrease the risk of abdominal cancer. Dates have as many as 20 different kinds of amino acids that make dates easily digestible. Dates have an anti-inflammatory effect mainly because they contain magnesium as well as tannins. Eating dates will increase your magnesium intake that reduces your risk of arthritis, heart disease, Alzheimer's disease, and many other inflammatory health ailments. Dates contain vitamin A, lutein, beta-carotene, and xanthin that promote healthy vision. Vitamin A is essential for reducing the frequency of night blindness. The light-filtering function of xanthin enables dates also protects you from macular degeneration. One of the benefits of eating dates is better skin. Vitamin A in dates promotes youthful glowing skin. It has antioxidant properties that prevent free radical damage to your skin cells and also impede aging process. Vitamin C in dates also helps keep your skin toned and firm, whereas vitamin B5 helps repair skin damage. Dates are great for your intestinal health because they trigger the growth of friendly bacteria in the gut. The nicotine content also helps cure intestinal disorders. Eating dates during pregnancy prevents issues such as constipation, bloating, and other intestinal problems. Limit your intake of your dates if you are pregnant and have gestational diabetes. If you are under weight, include dates in your diet for great effects. Due to their high caloric content (20-60 calories per date), you will start putting on weight in no time. You can eat 5-6 dates daily or you can add dates to puddings, cakes, and other baked items. Eating dates will provide you with instant energy. A 100g serving of dates provide you with 300kcal of energy. They have 29g of natural sugars, including sucrose, glucose, and fructose, and they also provide you with 31g of carbs and 3g of dietary fiber. Therefore, you can always rely on dates to boost energy. Dates have organic sulfur that helps reduce allergic reactions and save you from seasonal allergies as well. You may also notice a reduction in the severity of your allergy symptoms after eating dates. After consuming a little too much of alcohol, it is natural to feel sick due to alcoholic intoxication. Eating dates will provide you with quick relief because of its sobering effect. Eat them in the morning after a party night to avoid dealing with severe hangovers. Dates are beneficial for your hair because they have vitamin B5 which helps prevent issues like split ends, brittle hair, and so on. Dry dates serve as a great remedy to treat excessive hair fall. They not only protect hair root and scalp but also make hair shiny and healthy. There are many benefits of eating dates, but they are high in calories, so it is a good idea to limit your intake of dates. You get about 65 calories from a single jumbo-sized Medjool date, whereas one-half-cup serving of Deglet Noor dates contains about 200 calories. Eat no more than one-half-cup serving, depending on your daily calorie allowance. How Much Protein Is There in Milk?